Our therapists understand the importance of normalizing movement to maximize health. Strength and flexibility, as well as coordinated movement are essential for pain free movement, injury prevention and maximum performance, and a general well being. Pilates was originally developed as a rehabilitation tool that our therapists incorporate into each patient’s individualized exercise program. Our therapists believe in empowering our patients to take control of their condition. At Physioactive our therapists spend a half hour of one on one time with you at every session to ensure you are performing your home program optimally. Our therapists understand the importance of breathing. It is something we do 25,000 times a day and most therapists and patients do not understand how important it is. Many of the ancient arts such as yoga, pilates and tai chi incorporate breathing with normal movement patterning. We have had success eliminating neck pain merely by teaching people to breathe from their diaphragm instead of over using their neck muscles. 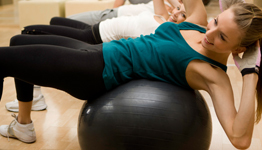 Pilates and yoga are an excellent tool to promote recovery, prevent injury, and promote general well-being. We have specialized programs where we use yoga to assist patients diagnosed with scoliosis. However, we also use yoga, or yoga movements in our individualized exercise programs. With the new introduction of yoga and Pilates classes, we strive to use a group environment to motivate our clients to continue to maintain their gains achieved during therapy.